This Blade HQ exclusive TR-5 automatic model has a fish scale patterned, black anodized aluminum handle with a two-tone black back spacer/lanyard attachment, and a deep carry tip-up pocket clip. 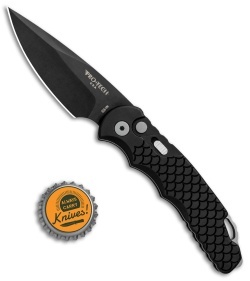 Its blade is made from CPM-S35VN stainless steel in a black finish. A sliding safety lock allows secure pocket carry and prevents accidental blade deployment. I think this is the best knife I have bought so far. Customer service was outstanding. They got my order processed and shipped in a days time. They even gave me priority shipping at no extra cost. Very nice auto knife by protech. Good edc blade length with a premium steel. Love the fishscale pattern on the handles! Adds traction without being overly rough or aggressive. The recessed screws on the deep carry pocket clip and integrated glass breaker in the backspacer are nice touches as well. Buy this knife! Quick delivery in about 3 business days, paid the extra $2or3 for USPS First Class to FL. This is my second ProTech (other is ProTechEmerson CQC7) and Im really enjoying their knives. They do come oiled up, this being a little more so than my CQC7, which I guess is expected with Auto knives. So expect to do some minor cleaning, just be sure not to take all the oil off especially around the pulley. 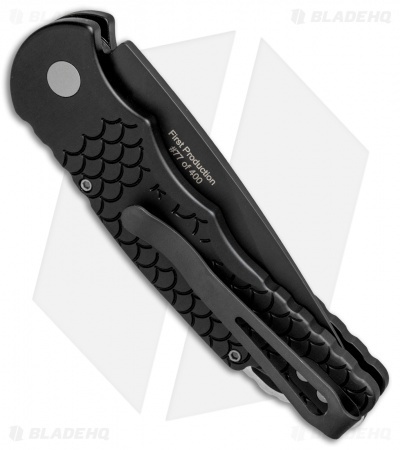 I really like this fish scale handle, adds a slight texture and just a different look and feel, since most ProTechs can be a little plain looking. The clip on this TR-5 far surpasses the clip on the Emerson CQC-7, as it is easier to clip on but doesn't feel like it's cheap or will slide off (The CQC7 is very stiff and strong but can be bent to loosen if your carful but you may need to take off handle to do so, incase you were wondering). The ergonomics of the handle on the TR5 feels really good in my hand, especially compared to CQC-7 and/or most of the lower cost PT Auto's. The one con I have for both of my ProTech Autos is how they have just a slight bit of side to side play when blade is opened that can ONLY be slightly felt but not seen. 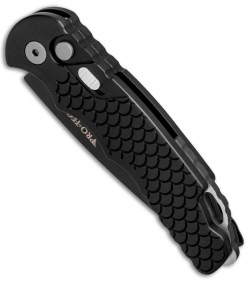 Its not bad by any means, otherwise I would not continue to buy them, its very minimal and still feels very solid, but not as solid as my ZT Hinderer, although it is close. I'm no craftsman or pro but I feel like this may be a common thing with Automatic knives, no matter what brand because I have played around with other high quality NON ProTech Autos at Gun and Knife shows and they all had just a little more play than the ProTechs so I'm assuming this is common for Automatic knives. Again this knife is very solid, and the minimal play could likely be that it just needs a hair width more of space on the pulley for it to function as perfect as these autos do. Again, Im no craftsman I have only owned a good amount of quality knives (these being my first Autos), so its very possible that they could be adjusted perfectly so it goes away. Just be careful if you do this as adjusting these knives take patients and only minor tweaking (for the most part) to get it right, and can easily be over or under tightened. I was able to make some minor adjustments and got mine very very close to being completely firm and solid with no blade play when it is opened, while also keeping it functioning smooth, quick, and solid. Don't let that deter you from purchasing any of these knives. They really are excellent knives and everyone should at least try one out at some point. BTW the blade came SUPER SHARP so thats always a plus!